this is not a paid post! this is an honest-to-goodness testimonial! if you know me, then you must be well-acquainted with my buhaghag hair. i have tried many shampoos that promised straight, silky, soft, smooth, shiny hair. ok my hair will never be any of that unless i get a blowout at the beauty parlor. i'll even settle for soft and untangled. i've tried a lot of brands, from cheap supermarket brands to expensive salon-exclusive labels. the best so far is kérastase, but who can afford to use that on a regular basis? 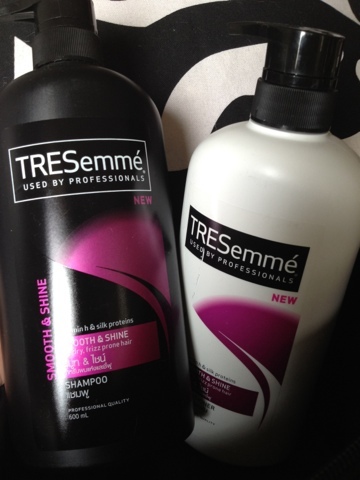 i have to wait for free samples hehe..
so when i saw photos of tresemmé popping up on instagram, i thought ho-hum another shampoo and conditioner claiming to give you straight, silky, soft, smooth, shiny hair—yes, all the s's. i didn't bite. till i received a full bottle each of the shampoo and conditioner at the JC buendia fashion gala last month. it even took me a while to take them out of the bag. and when i finally did and used them, oh em gee, i love it! shampoo pa lang my hair felt so soft na, i didn't even have to use the conditioner! which of course made my hair even softer. now my hair will never be straight without a proper blowout, but with tresemmé at least my hair is less buhaghag.